In Hawaii, Nature Tends to be a Bit of a Show-off. There are primarily six major islands to visit in Hawaii: Kauai, Oahu, Molokai, Lanai, Maui, and Hawaii’s Big island. You’ll find each island has its own distinct personality and offers its own adventures, activities, and sightseeing opportunities. Explore the islands, Maui’s waterfalls and winding back roads on a four-wheel adventure through Kauai. Discover lush rain forests and orchid-scented botanical gardens on Hawaii, and hike Oahu’s Diamond Head and Koko Head volcanoes. Come experience the wonders of Hawaii on an incredible cruise vacation. 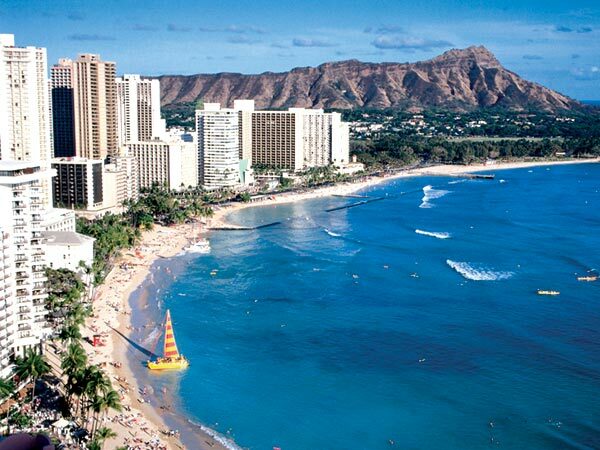 Hawaii’s most populous and famous island, Oahu is renowned for its shopping, its food, its beautiful beaches, and its breathtaking views. Check out the surfers on the North Shore, or Diamond Head Crater in Waikiki. The second largest Hawaiian island, Maui is known for its numerous beaches, rain forests, waterfalls, eucalyptus groves, and even unique cattle ranches. Don’t miss the view from Haleakala, the largest dormant volcano in the world. So green it’s been nicknamed the “Garden Island,” Kauai is a lush, largely unexplored paradise. Snorkel in its beautiful turquoise waters or explore the rain forests where Jurassic Park was shot. The island of Hawaii is called the Big Island with good reason. It’s more than twice the size of all the other Hawaiian islands combined. And every inch is covered with lush scenery, from rugged volcanoes to waterfalls and rain forests. It’s home to the steaming craters and hardened-lava rivers of Hawaii Volcanoes National Park. Days onboard are casual, and you’ll be most comfortable in sport clothes and resort wear. Shoes should be low-heeled for deck activities. Bring a few swimsuits so you’ll always have a dry one. You don’t have to bring towels, as they are provided. And don’t forget your camera and binoculars, so you don’t miss a thing. Ashore, you’ll need comfortable walking shoes as well as a hat and sunscreen for protection from the sun.